Crystal Couture Inc. (CCI) has chosen to use a flat rate system to calculate shipping and handling. All USA packages will be shipped via USPS or UPS. 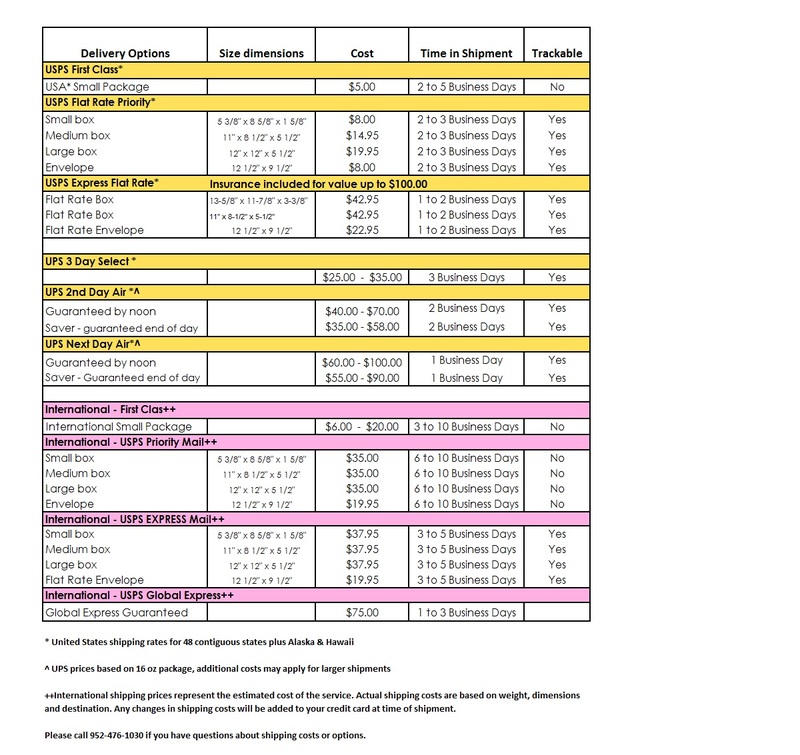 Please refer to the shipping table below for a summary of your shipping options. If your order exceeds the parameters or guidelines we have outlined below, Customer Service will contact you to evaluate the most effective shipping method for your needs. Orders are shipped on business days only. In this case, business days are considered to be Monday through Friday, not including U.S. holidays. Orders placed on holidays, Saturdays or Sundays, will be processed in most cases the following business day. The majority of orders are processed and shipped within twenty-four hours (not including weekends or holidays). Special efforts are made to expedite internal processing of 2nd Day and Overnight orders. Although we cannot guarantee same day shipping, you increase the likelihood if you place your order prior to 12:00 noon Central Standard Time. Most orders placed after 12:00 noon will be shipped the following business day. A signature is required on priority and express shipment unless waived by the addressee. If you choose to waive the signature requirement, Crystal Couture cannot be held responsible for lost or stolen packages. International shipping rates will be calculated by destination, weight and dimension and will be charged to our customer's credit card at time of shipment. USPS international orders are not our responsibility once they leave the USA. Sometimes customs can take a day or two and sometimes they take several weeks. If your package has not arrived, please contact your local customs office. We have no way of tracking it once it leaves the United States. We recommend you purchase insurance and select a shipping option that includes tracking. International USPS First Class, USPS Priority and USPS Global Priority shipping methods are not trackable. Therefore, if they are lost or damaged and insurance has not been purchased, we are unable to replace the order. For this reason, we recommend either purchasing insurance or using a different shipping method if you are not willing to take the risk. After checking out, you will receive an email with a copy of your order. When the product is shipped, you will receive a second email with your tracking information. Shipping confirmation with tracking number will be provided to you via email. Use the tracking number provided to track your package at www.usps.com or www.ups.com depending on the carrier you chose to use. If you would like to change your order, please call us at 866-476-1030 or email us at [email protected] as soon as possible. Please state your order number and name for our reference. Depending upon the status of your order, we will determine if it can be changed or not. We will do our best to accommodate your requests. Once your order has been shipped, it cannot be recalled or cancelled. We are required by law to charge sales tax on orders being shipped to Minnesota. Recipients of all orders are responsible for complying with state and local tax laws. Orders that are shipped to other destinations are not charged sales tax. Our system does support shipping to multiple addresses in one order. Please contact customer service if you need assistance with this feature. We have made every effort to ensure that your online transaction with us is safe and secure. We use sophisticated encryption technology through industry leader Authorize.net in order to safeguard your information. If your credit card is declined, we will inform you of this and try to understand if it is an address mismatch error or possibly request a new card number. If the problem is not corrected within 2 business days, we will have to cancel your order and resubmit after the error is corrected. If you are not comfortable with providing your credit card information online, please feel free to call us to place your order. Our toll free number is 866-476-1030. Customer service representatives are standing by to assist you. DO NOT SEND CREDIT CARD INFORMATION VIA EMAIL. Email is not a secure method of transmitting credit card information. If an item is backordered, you will be informed via email or phone call and advised of an expected ship date of the item or items or explore making a substitution. Backordered items are shipped via the originally selected shipping method as soon as they become available. If your order contains both backordered and available items, the in stock items will be shipped immediately and backordered items will be shipped as soon as they become available. You will not be charged for backordered items until we are ready to ship it. If you wish to cancel the backordered item(s), please do so by contacting us via email at [email protected] or by phone at 866-476-1030 . We have made every effort to ensure that your order is correct and that it arrives in excellent condition. Every packed order is inspected twice for accuracy by our top-notch warehouse staff. If you do find an error, please contact us immediately via email at [email protected] or call customer service at 866-476-1030 . When your order arrives, please inspect it for any damage that may have been caused during shipping. If a product has been broken or damaged during shipping, please call or email a Crystal Couture customer service representative immediately to receive instructions. Please be sure to keep the box, packaging materials, and the damaged items for inspection by the carrier. If this is not done, we are not responsible to replace the damaged items. CCI stands behind the quality of their products. If you are not completely satisfied with your purchase, please return the item or items in their original condition and we will gladly refund the full purchase price for up to 30 days (excluding consignment costumes from Encore Costume Couture). Shipping is not refundable, however. Please see our return instructions for details. Some restrictions apply. Returns are accepted within 30 days of your date of purchase (excluding consignment costumes from Encore Costume Couture). • Your CCI invoice or packing slip. • Item or items to be returned in all in their original packaging. • Return Authorization number you received from Customer Service. You will be notified via email when your return has been processed. Please allow up to 30 days for processing. Items purchased elsewhere must be returned to the place where you purchased them. No exceptions will be made. All returned products are subject to inspection by CCI staff. Products found to be altered, over half used, or damaged are non-returnable and will be sent back to the customer. The purchase price of returned items will not be refunded to your credit card until items are inspected and approved. Consignment Costumes from Encore Costume Couture are not returnable. If you are returning a gift, please call customer service toll free at 866-476-1030. For verification, please have your CCI packing slip available. Gifts returns are also subject to the return restrictions listed above. Approved returns may select either a CCI online credit or a refund made to the credit card of the purchaser. 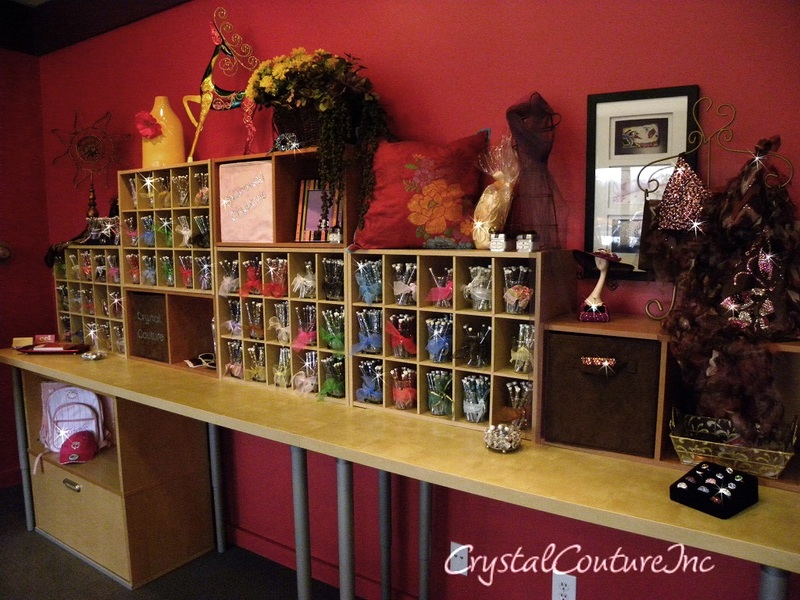 All items purchased from crystalcoutureinc.com are made pursuant to a shipment contract. This means that the risk of loss and title for such items pass to you upon our delivery to the carrier.